Little Cueto is proof enough that gastronomic treats are to be found in the most unlikely places. The Cueto neighbourhood in Santander’s north has long been prized for its time-lapsed rural delights. In recent years, large urban developments have begun encroaching, though traditionalists still cling stubbornly to the past, especially when it comes to the architecture. The restaurant is unexpected on two counts. One is its location – a small, low slung farm building that dates back a hundred years. 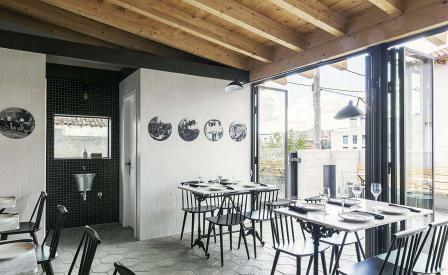 The second is that Madrid-based studio Zooco was tapped to convert it into a contemporary pizzeria. The small dining area – lined with ceiling beams and spidery strings of light fixtures – opens out through dark-framed concertina doors into a pint-sized terrace that overlooks the neighbouring tiled roofline. A perfectly evocative space, in other words, to tuck into the piping hot pizzas that emerge from the oven in the open counter kitchen.